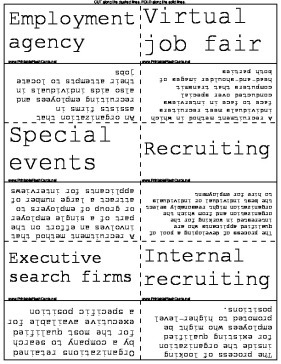 Internal recruiting The process of looking inside the organization for existing qualified employees who might be promoted to higher-level positions. Job posting A mechanism for internal recruiting in which vacancies in the organization are publicized through various media such as company newsletters, bulletin boards, internal memos, and the firm's intranet. Market Pricing Determines pay ranges based directly on rates paid in the external market. Job Evaluation is a systematic technique for determining the relative worth or value of jobs to the firm in order to establish pay differentials. Broadbanding The movement toward a small number of "fat" pay grades.